I love breakfast foods, I love cake, carrot cake is pretty good. Hey, so it oatmeal! 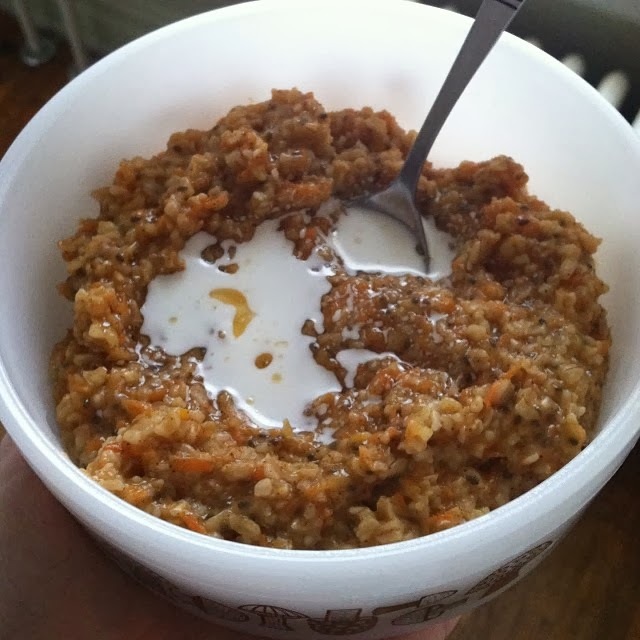 So, why not put the two together (kind of) and make a super yummy oatmeal. Guess what kids, I did just that and here it is now for you to enjoy. Don't be afraid, make some, and "indulge". I dare you! Place first three ingredients in a small pot and bring to a boil. Add the oats amd boil for about 5 minutes. Mix in ginger and cinnamon, taste, and if desired add more. Place in bowl and top with maple syrup, and coconut butter. You could also top with raisins, shredded coconut, pineapple, walnuts. But I just used what I had on hand, and it was so good!